AVS Ventilation System: The Ariete Ventilation System uses carefully chosen areas for the intake and exhaust of cooling air. Airflow from the goggles, whose upper front profile is specially lowered to aid this process, enters the collecting vents at the front of the frame, flows across the rider's face, and leaves the back of the frame in a continuous process. Compatible with the full range of Ariete accessories! 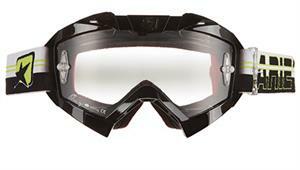 All Ariete goggles and accessories are designed and made in Italy.